Flocks of up to fourteen (14) P.lujiatunensis individuals are to be kept within containment pens featuring a minimum floor area of nine thousand three hundred and seventy five (9375) square meters. These containment pens are to feature fencing with a classification of ‘low’ with no rope or chainlink-based fencing used as the beaks of P.lujiatunensis can quite easily breach containment of low class fences made primarily with those materials. Fencing is to be checked on a weekly basis for any signs of damage or general wear and any found instances of either to be repaired by assigned maintenance staff as soon as possible. The containment areas for P.lujiatunensis flocks are to be made up of thickly foliated ground with a low upper-canopy to mimic the forests present in the Yixian formation. Alongside this several stable rock piles should be made and placed within P.lujiatunensis containment areas to promote natural hiding behaviour should individuals become startled, or otherwise alarmed, and thus have a safe place to retreat to. Natural water sources for P.lujiatunensis are not a requirement for containment as P.lujiatunensis does not benefit at all from the presence of a pond, stream or other water-based feature in their containment pens outside of conventional water troughs. Feeding for P.lujiatunensis individuals is to consist of two (2) kilograms of plant matter a day multiplied by the number of adult animals present in the containment area. Recall procedures for P.lujiatunensis individuals follow standard Class D Ornithischian Containment Procedures. Usage of lethal force is strictly prohibited due to the lack of threat P.lujiatunensis individuals present to park patrons and staff, however, issuing of both tranquilizer rifles and net guns is fully authorised and does not require the consent of the board of directors for usage in recontainment of P.lujiatunensis. P.lujiatunensis is an averaged sized species within the Psittacosaurus genus standing at one hundred and seventy seven centimetres (177cm/1.77m) in a straight line and weighing in at forty five (45) kilograms on average. In terms of appearance, P.lujiatunensis resembles P.sp quite heavily, with a similar skull, colour palette and a pattern scheme that is a semblance of a precursor to the one seen on P.sp. 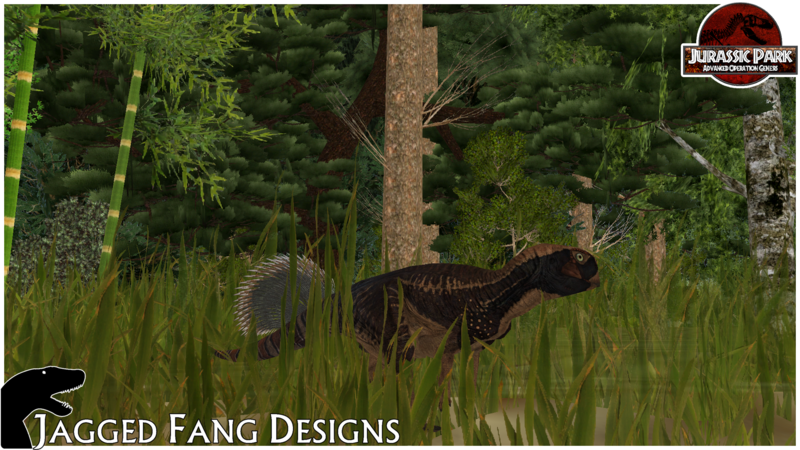 The colouration of P.lujiatunensis consists of a heavy mixture of dark and earthy browns with a small, scattered patch of blue tones around the animal's hindquarters while the animal's quills have a mostly grey body with a brown stripe near their ends and white tips. The face of P.lujiatunensis resembles that of P.sp greatly, with similarly arranged cheek-spikes and feature scales, however, P.lujiatunensis features a slightly more bulky head with the darker area being spread over much more of the animals face than in P.sp. P.lujiatunensis has an odd history in the Dinosaur trade with it being unavailable for several decades while P.sp took the spotlight and even its name, as P.sp was advertised as P.lujiatunensis until the recent appearance of the actual animal on the market forced the majority of parks to use the proper name for P.sp. This however has had a large knock-on effect to how each species is treated, due to an overall more prominent pattern scheme and a more vivid transition between the browns featured on it P.lujiatunensis has actively pushed most parks to replaces their P.sp stock with it as the animal demands less space, breeds at a slower rate and is overall more popular with the public, while P.sp has been pushed into becoming the first widely farmed non-avian Dinosaur for meat on the planet due to its high reproduction rate and high bulk in comparison to P.lujiatunensis. Behaviourally P.lujiatunensis is near on identical to the animal it replaced, living in harems up to fourteen (14) individuals strong with a singular patriarch and up to two other lesser males with all of these males typically being sons of the patriarch with these lesser males often squabbling over their position in the group in order to establish which of them will become patriarch upon the current males death. Much like in P.sp, the majority of males, upon reaching adolescence, are rejected by the group and put up for sale for both parks and private collectors. While a one star animal P.lujiatunensis has done well to earn it through the mass displacement its appearance caused in the Dinosaur trade. This has also sat well with the majority of private collectors who have sold their P.sp populations to farms and replaced them with the more visually appealing P.lujiatunensis. However, a side effect of all this has been the production of two wild P.sp populations as farms ill-equipped to contain P.sp have lost individuals, these populations however are kept under control by local wildlife authorities in [REDACTED] and are not considered an active ecological threat to the ecosystems they have invaded, quite the contrary as one of the two populations has taken up a niche once occupied by a now locally extinct population of wild boar.